Teck’s Highland Valley Copper Operations, an open-pit mine located in British Columbia, Canada, produces copper and molybdenum. Accurate tracking of blast movement helps improve operational efficiency at Highland Valley Copper. An example blast demonstrates the extent of movement and recovered value. Movement occurs within all blasts, and horizontal movement variation ±50% from the mean is common. The ore control team increased revenue by C$100,0002, which is calculated from the additional ore recovered minus the copper that would have been recovered from dilution if the ore blocks were mined in situ. 1. Numbers are generated from BMM Explorer and rounded. 2. Supplied by Highland Valley Copper and calculated at a copper price of US$5,500/t. 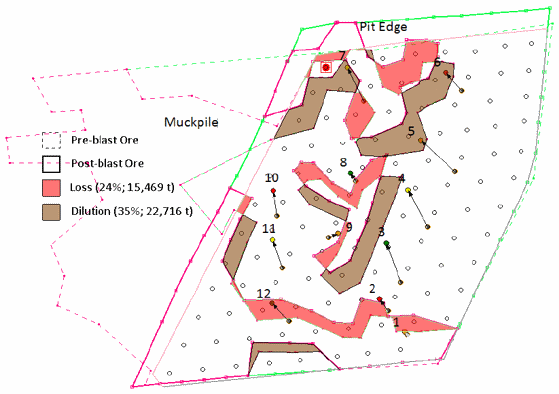 This blast map shows pre- and post-blast ore polygons, and areas of ore loss (pink) and dilution (brown). In this blast, if ore bodies had been mined in their in situ positions, 22,716 t of waste would have been sent to the mill and 15,469 t of high grade ore sent to the waste pile. Ore loss occurs when material containing grade (ore) is incorrectly sent to a waste dump. Dilution occurs when waste is unintentionally mined with material containing ore and sent to the mill.